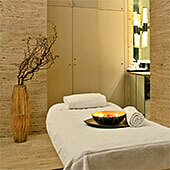 Milan Park Hyatt Hotel, Milan, Italy - GourmetVoyageurs.com - Upscale Food and Travel eMagazine. Now the Hyatt hotels are princely; the Park Hyatts are fit for a king (or a “re” in Italiano). Stay with me and we’ll all be speaking the language in short order! First of all, the Park Hyatt Milan is a 5 star boutique hotel housed in a palace born in 1870; however what was old is super-new and in the best of taste. Read on . . . 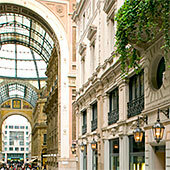 The lobby gleams beneath an enormous glass cupola which pays homage to the arched glass ceiling covering the nearby Galleria Vittorio Emanuele II with its chic boutiques and charming cafes. I offer a heart-felt "grazie mille" for my deluxe room arranged by the Park Hyatt Milan’s congenial General Manager, Claudio Ceccherelli. Loads of Carrera marble accenting the walls and forming my desk and the floor of the bathroom fitted with a big tub and a huge walk-in rain shower. Super comfy king bed and flat screen with 10 English channels plus others from Arabic to Russian with many Italian in between. One wall had windows looking into the Galleria with mobs of people gawking at all its attractions. Very complete digs even my own with an "Illy" expresso maker. This historic palace-style building dates back to 1870. This boutique Milan hotel showcases eye-catching interiors designed by Ed Tuttle and a remarkable glass cupola where Lucio Fontana's 'Head of Medusa' serves as a stunning centerpiece. The expansive 5-star rooms & suites, some of the most luxurious accommodation in Milan, beautifully blend authentic Italian finishes with sleek amenities and state-of-the-art technology. Located just five minutes from the Milan stock exchange and financial district, with superb meeting planning services and a fully staffed Business & Communication Centre, Park Hyatt is the perfect hotel if you are in the city on business. The gourmet cuisine of Chef Andrea Aprea, Neapolitan, the executive chef of Restaurant VUN, stands out amongst Milan restaurants in their own right. His cuisine expresses itself through three simple foundations: technique, innovation and respect for the Italian gastronomic tradition. The choice of ingredients is essential for Chef Aprea. 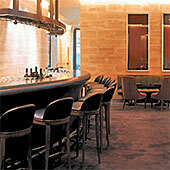 The restaurant’s suppliers are mostly Italian and all are subject to rigorous selection procedures. “My contemporary cuisine looks to the future, but never forgets its origins!” Adorned with pastel Venetian stucco finishes, The Spa is an oasis for body and mind and features a diverse variety of salon treatments and holistic therapies in a setting of sheer opulence. All rights reserved peter d'aprix ©1985-2017. No copying, reuse or partial reproduction permitted without written permission by the authors, Peter and Linda D'Aprix.